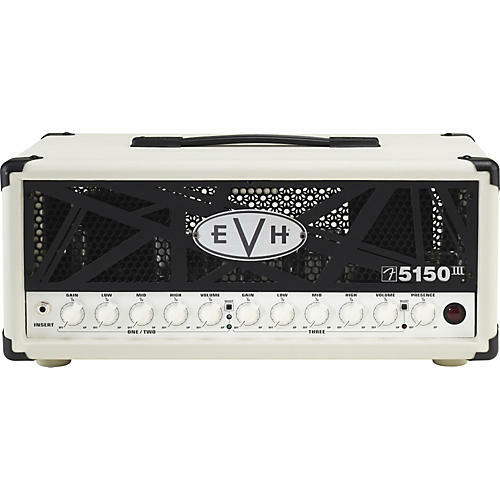 The EVH 5150III 50-Watt Head is a scaled-down version of its acclaimed 100-watt big brother-the mighty 5150 III head-with many of the same great features. Its smaller size and portability make it a perfect amp for players who want arena volume, tone and performance in a compact package. It pairs perfectly with the new EVH 5150 III 2x12 and 1x12 cabs, in addition to the current EVH 5150 III 4x12 cabinet. It's a three-channel amp; channels one and two share EQ, with gain, low, mid, high and volume controls; channel three has gain, low, mid, high, volume and master presence and resonance controls. Other features include selectable impedance (4, 8 or 16 ohms), dual parallel speaker output jacks, effects loop, headphone jack, line out and black hardware. Included four-button footswitch has 1/4" input jack; also accommodates MIDI footswitching.